My name is Giovanni (Gianni for all my relatives and friends), I come from Italy and I am 40 years old. I am an engineer and I work as Production Manager in the engineering industry. Always backpacker traveler, self taught photographer, enthusiastic observer of people with a culture different from mine. 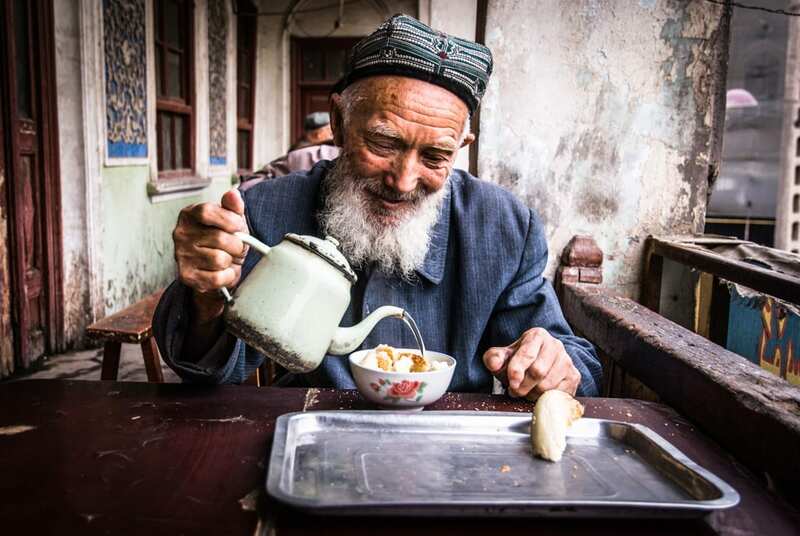 This smiling old man is having a traditional Uighur breakfast with light green tea and a sweet bread with sesame seeds in a old tea room of Kashgar. Uighur people live in the Xinjiang Uyghur Autonomous Region, in the People’s Republic of China, they are a Turkic ethnic group and they primarily practice Islam. There are many difficult contrasts between China Government and Uighur Community: Uighur people are literally fighting to preserve their identity. I was just talking with my wife last week about my trip in the Xinjiang province, in particular in the old city called Kahasgar. I would like to go there again with a better photographic experience than 6 years ago, a better equipment ( I used a Nikon d80) in order to describe better the situation of the Uyguir people, to tell their story in a better way. I would like to go there again to see what remains of the old city: probably I have had the possibility to see some old houses that also Marco Polo have seen, and now the chinese government are destroying and rebuilding the downtown, without any rules. But the worst thing is that they are trying to cancel the Uyguir traditions, costumes, language, way of life. So Uyguir language is forbidden in the schools since 2017, thousands of han ethnic people are forcibly moved by the government in Xinjiang to “colonize” the area, and so on. Another Tibet, with less media resonance.